Are you ready to take a leap of faith and experience the exhiliration of a bungy jump? 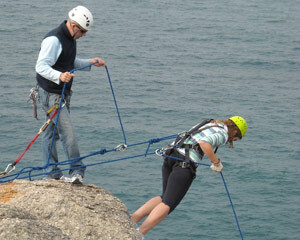 Bungy jumping is one of the real adventure sports and enables you to tackle your own fears head-on. 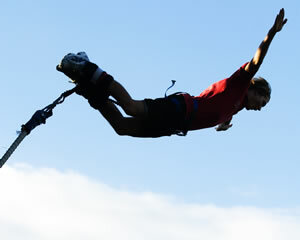 Bungy jumping is available to people of all ages and experience levels. Bungy jumping on the Gold Coast, in Sydney, Brisbane, Adelaide, Melbourne and Perth is definitely something you should be considering on your next holiday.If you're not one for jumping of platforms in the sky, you can give the perfect gift of a bungy jumping voucher to friends and family. Doing a bungy jump is something you'll never forget and it can be addictive. So get strapped in, master your fears and bungy jump. For the best adrenalin rush you could possibly imagine, join us for a bungee jump experience 14 stories above the Gold Coast! With a tower height of 40 metres, you will have the opportunity to take a leap of faith and see if you have what it takes to be in the bungee club! 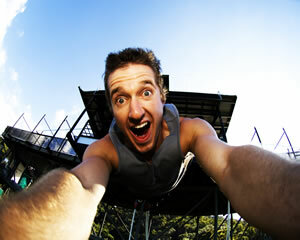 Take the leap of faith and bungy jump from 14 stories up (40 metres) above the Gold Coast. 54321 Bungy challenge the limits of your mind and test the edge of fear by leaping off a 50-metre rainforest bungy. Join us for a fun day learning the tricks of the trade! You and three friends can experience the thrill and adrenalin of the flying trapeze and bungee-trampoline. You'll be running away with the circus in no time after your circus skills workshop! Is the circus calling you? Join us for a fun time learning the basics of circus skills. From trapeze flying and the choice between juggling skool and static trapeze. From knee-hangs and back-flips to aerial poses and manoeuvres on the static rig! Be prepared for a challenging couple of hours! Learn how to fly on the trapeze, bungee-trampoline and juggle balls, diablos and devil-sticks! Enjoy 2 half days experiencing the life of a circus entertainer as you and your friend learn the tricks of the trade. Then relax in your luxury accommodation after a hard day's work! Learn how to fly on the trapeze, bungee-trampoline and juggle balls and devil-sticks! Enjoy 2 half days experiencing the life of a circus entertainer as you and your friend learn the tricks of the trade in this circus skills workshop. Then relax in your luxury accommodation after a hard day's work! Do you enjoy swinging upside-down and acting like a 'clown'? You and three friends can experience the thrill of the flying circus trapeze, bungee-trampolining and maybe even juggling! Then after a fun day at the workshop, retire to your accommodation on the stunning Sunshine Coast! Do you enjoy swinging upside-down and acting like a 'clown'? You and three friends can experience the thrill of the flying circus trapeze, bungee-trampolining and juggling! Then after a fun day at the circus skills workshop, retire to your accommodation on the stunning Sunshine Coast! Join us for a fun day learning the tricks of the trade! You and three friends can experience the thrill and adrenalin of the flying trapeze and bungee-trampoline. You'll be running away with the circus in no time! Free-fall 12 stories or 35 metres in less than two seconds on the Flycoaster free-fall ride in Surfers Paradise! Experience a unique and safe ride that combines the amazing adrenaline rush of hang gliding, bungy jumping and skydiving all at once. You and two friends can free-fall 12 stories or 35 metres in less than two seconds on the Flycoaster free-fall ride in Surfers Paradise! Experience a unique and safe ride that combines the amazing adrenaline rush of hang gliding, bungy jumping and skydiving all at once. You and a friend can free-fall 12 stories or 35 metres in less than two seconds in Surfers Paradise! The Flycoaster ride will let you experience the amazing adrenaline rush of hang gliding, bungy jumping and skydiving all at once. Have you ever wanted to glide through the tree tops of the Daintree Rainforest. Our scientist guides will lead you on a unique and exhilarating tour with views as far as the Great Barrier Reef! Gliding through the canopy from treetop to treetop. It's your flight choice - slow, fast or upside-down? Jungle Surfing takes you on a unique rainforest tour where your feet don't touch the ground, as you fly from tree to tree on ziplines in beautiful Cape Tribulation. The Sunshine Coast's funnest activity is the Flying Trapeze! You'll have an unforgettable experience - imagine flying through the air, you're in control, but completely safe too! Do amazing circus tricks, things you never thought possible and love every second. Not many people get this opportunity! This 45m Swing is designed to give the ultimate ground rush feeling in a controlled environment. Feel yourself freefall briefly and then swing low to the ground before heading back up in a swing formation. One, two or three people at a time can ride. Ever wanted to swing high in the air from 45m and then plunge low towards the ground for the ultimate adrenalin rush? As you lie in the hanging harness of the Minjin Jungle Swing, you are in complete control as you decide exactly when to pull the release cord! Come skydiving at the centre closest to Melbourne - only 45 minutes from CBD in the beautiful Yarra Valley. Experience a "ground rush," where you'll be leaving the plane at 6,000 feet giving you the rush of freefall! Many say it's more exhilarating than bungee jumping! Climb to the top of our tower to experience the bungee jump of a lifetime! Whether you decide to touch the water when you bungee jump or to remain dry, this jump is definitely going to get the adrenalin pumping. If extreme sports are your thing, you just can't go past the tower bungee jump! Climb to the top of our tower to experience the bungy jump of a lifetime! Whether you decide to touch the water when you bungy jump or to remain dry, this jump is definately going to get the adrenalin pumping. If extreme sports are your thing, you just can't go past the tower bungy jump!